The land and energy here have inspired the creation of a number of sacred rock works, each holding its own divine intent. The owners of the ranch work with the energetic pathways that flow beneath and above the land and the spiritual qualities of the stones to create these sites of connection and contemplation. This is usually the first site visitors see as they approach the ranch. It consists of three intersecting arches emerging from a stone foundation topped with turquoise quartzite chops, crowned by a large piece of selenite. Labyrinths are ancient patterns that have one path that gently winds its way to the center. Found in many different cultures around the world, this eleven circuit medieval design is based on the one found in the Chartres Cathedral in France. Located in the far corner of the property, this semi-circle of basalt columns of ascending heights built into a hillside is partially encompassed by a rock wall, which was created to the draw the energy inwards toward the land. There is a smaller piece of basalt in the center that holds a stone tablet. This was inspired by the Ring of Brodgar in Orkney, Scotland. There are nine stones in a circle, with the largest heading due west. The fire pit is a sunken stone circle that has an iron fire cauldron in the center. Over forty people can sit on the circular ledge surrounding the pit, which is in the middle of a large stone terrace. Giant turquoise quatzite standing stones guard the entrance to this area. This site is a favorite. The Tower of Power is a circular stone wall, with a 24-foot diameter, that starts four feet below the earth. It ascends five more feet into the sky before evolving into seven towers. The circle is approached through a descending stone walkway that leads to the low entryway. Inside houses a tiny firepit built into one of the seven towers. Held together by gravity alone, the Moongate is a circle of turquoise quartzite stones that grows vertically from an expanded base. It is aligned across the pond with the moongate entrance of the Secret Garden and looks through to the Mother Guardian Stone and beyond into the Notch. There are large standing stones placed throughout the ranch. The Female Guardian faces The Notch and connects with the glacial forces of the national park. The Male Guardian is at the ranch border and protects the land. 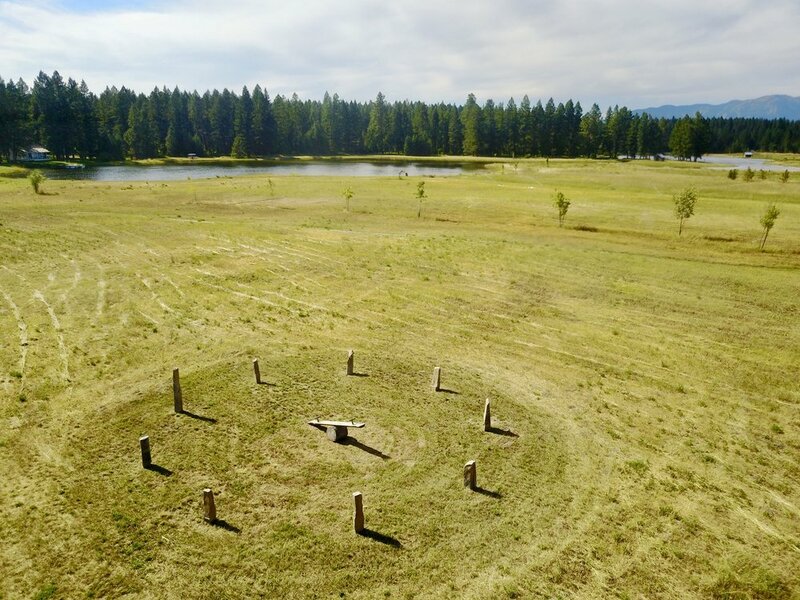 Other single stones are placed on the ranch to align with different energetic ley lines. The Stargate is a tall standing stone in the middle of large pieces of turquoise quartzite, each aligned with the four directions. A spiral of potentilla bushes guards the entrance. This list of sites is just a taste, as there are many more to be discovered during your exploration of the property. Guests are invited to experience these sites and connect with their purpose and meaning. We will be happy to discuss more details in person and relate the intentions of the creators of these sites and the more cosmic implications.